Just as it seems a drowning is imminent, something catches the corner of my eye as I speed down Highway 55 South (picture above); the unmistakable sign of remodeling underway. But there?! It can’t be possible! Even though it happened well before I was born, I’m still marveling over how the highway system chewed up St. Louis City. The series of chopped off streets lining Interstates 55, 44 & 70 within the city limits is both fascinating and painful. Haven Street (above) is just one of hundreds of examples of where the sidewalk ends, and how it creates these creepy black holes and uncomfortable terrains within a neighborhood. I’ve pedaled through this particular area on a regular basis, and always chuckled nervously over this red asbestos shingled, 2-story vertical rectangle. Abandoned and decaying, it’s cut off from the rest of the neighborhood through no fault of its own. Its prominent, solitary placement on the peak of a hill makes it stick out like the last hair on a bald man’s head. The shadow it casts often hides the tiny satellite shack to its west. It’s a curiosity that someone lives in the satellite shack, as it’s even more remote from the neighborhood, and the views are either of a rotting tower up on its tail or the highway. 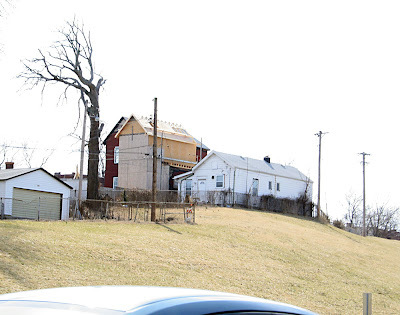 I’m not an advocate of tearing down, but in this case, getting rid of the red house seemed like a way to maybe breathe some light and air into this strange little corner. 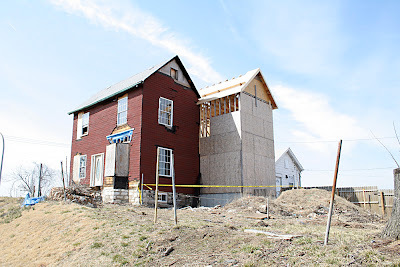 Like wildflowers sprouting up through blacktop, hope grows in the unlikeliest places, and someone is investing money and time to bring this house back to life. Even with new windows, doors and a plywood addition on the back, I wouldn’t have believed it was a current undertaking if not for the multiple pickup trucks out front and the freshly issued building permits hanging proudly. A scan through city records reveals that others shared my sentiments. This house, built in 1905, earned a demolition permit in January 2005. But that August, a man gave the city $5,000 and a set of construction plans. The city estimated it would cost $7,000 to tear it down. The new owner estimated $50,000 would make it a good investment property, and now he’s spending the money to prove it. Oh, the next door neighbor was built in 1890, and at 779 s.f. it really does qualify as a shack, by today’s standards. Starting with location, location, location, most everything about this investment renovation seems off kilter, yet it’s happening. 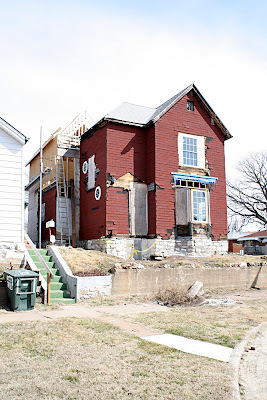 While the City Money Fathers wrangle over Old Post Office Square, Ballpark Village and Blairmont – projects that invariably get tagged as crucial to the vitality of St. Louis City – we have private individuals improving one house at a time. Private individuals undertake these projects for themselves, but it also revitalizes their block, and then, eventually, the neighborhood around them. One person venturing onto a seemingly dead block with a building permit usually creates a domino effect, and an area that was once iffy to drive through in broad daylight becomes a sweet spot to pedal through any time of day. Over the past 10 years, I’ve watched this scenario play out with increasing regularity, and it’s done so without a lot of press hoopla, tax breaks or political maneuvering. It is grass roots progress despite City Hall, undertaken by people who usually have to endure a standard amount of bureaucratic mickey mouse to make it happen. Yet they go through it all because they believe it’s worth it. You can’t change the world – or the City Hall – but you can change your own small piece of the city one plot of land at a time. 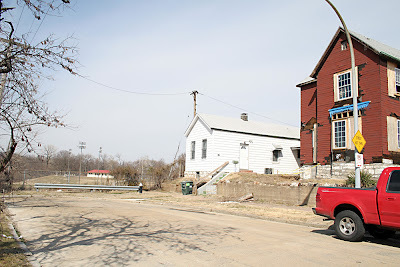 The unlikely renewal at Haven & Idaho Streets just about breaks my heart with gratitude, and reminds me to stay focused on what’s good about our city: that you can still work under the radar to create a positive chain reaction that benefits the most progressive people in it – St. Louis City homeowners, and those aiming to be. I exit from 55 by this house every day and for the longest time it sat with 3 walls against the red building. no roof and very aging plywood. But now!! wow, what a lot of progress a couple of weeks make. I think it has been within the last two weeks that hammers started swinging and the trusses and roof went on. I just drove by the front today and I think its also got some new doors and windows. So maybe he is rehabbing on income tax check money? I know I am but luckiy my rehab is coming to an end. I hope his check was much bigger than mine because he has a lot to do. I agree with your view of this place though. Interesting that they have decided to rehab this one when many other buildings are available in the neighborhood and may fetch a better price after the remodel. Maybe its the view?? I bet there is a good one of downtown from the top of that house. If you ask someone at Carondelet Betterment, Alderman Matt Villa, or his predecessor, Dan Gruen, they can all verify the building’s ten-plus year history of neglect. If a new owner’s finally in charge, that’s an encouraging sign. City records show a sale to a new owner in August 2005, many months after it issued a demolition permit. The only other permit activity it showed was for a chainlink fence to be erected a few years previous to the demo permit. And the day I took those photos, carpenter types were inside the place making construction noises, while their pick up trucks were parked outside. I’ll have to go back, noise around and bug them for info, and get to the bottom of it. The house in the picture has been in a state of slo-mo rehab since at least 1995. It was slated for demolition or rehab going back to the flood of ’93. The owner has been doing the minimum ever since. The picture you see today could have been shot ten years ago and you couldn’t tell the difference.